Where can you find a company where employees are happy, have high energy, great morale, and speak the same organizational language? Where people know not only what the organization’s values are, but use those values as their basis for making decisions? No, we don’t need to go to Shangri-La to find it. The road map, according to Joel Kurtzman, leads to common-purpose companies. 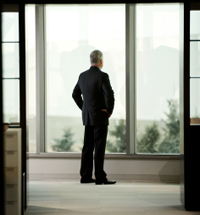 Kurtzman has spent more than 30 years working with global companies and their leaders. Common purpose is a term Kurtzman uses to talk about a quality of leadership that creates an enormous impact in an organization’s culture and spirit – its soul, if you will – that drives success beyond financial statements. While the concepts aren’t novel, when taken together he has observed significant patterns of success for leaders and in companies when they are integrated and authentically and consistently applied. In a recent interview, I asked him for some current examples of common purpose organizations: American Express , FM Global and Li & Fung Limited were on his list. Common purpose is about the type of leader a company has, he says: Amex’s CEO Ken Chenault has followed in the footsteps of former CEO Henry Golub who put a high priority on people, values and brand, helping employees understand the brand and values sufficiently that they make good decisions based on them. “We,” that elusive grail which is the subject of countless team building exercises, Human Resources’ angst, and management books, is an outcome when the CEO creates a bigger purpose for the organization than just making money or reaching quarterly numbers. Kurtzman cites as examples Microsoft’s aim to change the world and NASA’s executing President Kennedy’s vision to put a man on the moon. In both, everyone knew what they were focusing on and what the organization stood for – a common purpose. As a result of the financial crisis, the focus for most CEOs now, says Kurtzman, is thinking about making money, meeting next quarter’s numbers. As an economist he knows all about the importance of numbers, but what he sees changing and engaging cultures is more fundamental: tapping into the passion behind what a company stands for, to drive a common purpose. The sense of “we” starts with the leader. Leaders in any organization are under intense scrutiny, Kurtzman says. Those watching CEOs copy their style and behavior. In his extensive interviews with CEOs over the years, leaders have admitted the connections they have to their respective organizations are fragile, and can be easily broken. CEOs need to know how to read their organizations’ emotional tone. Committed-to-developing-a-shared-“we” CEOs need to engage in a number of behaviors that build trust including leading-by-listening, building bridges, showing compassion and caring, demonstrating their own commitment to the organization, and giving employees the authority to do their job while inspiring them to do their best work. Excessive executive compensation is a big barrier to being a common-purpose company Kurtzman says. “When people feel compensation is too much for those in leadership roles, it creates mistrust.” Leaders think they can survive with mistrust but ultimately they can’t,” he says. More than 20 years ago, when Kurtzman was business editor at The New York Times, he asked leadership guru Warren Bennis a question: How do leaders inspire and encourage followers to take action? Bennis replied that good leaders are deeply integrated into the business and emotional life of the organization and have a deep connection, a real fit. 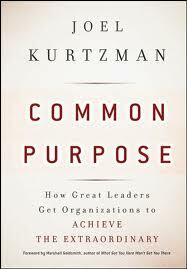 That question became the catalyst for Kurtzman’s most recent book, Common Purpose: How Great Leaders Get Organizations to Achieve the Extraordinary. The book is essentially a collection of leadership stories from Kurtzman’s interviews and research that illustrate how those in charge have developed or lost common purpose in their organizations, or whose styles precluded its possibility. Kurtzman refers often to the success of 175-year-old FM Global, a commercial insurance company, and its current chairman and CEO Shivan Subramaniam in building a common-purpose company. The company is united around the purpose that most losses are preventable. One-third of employees are engineers and the other two-thirds are trained to think like engineers. Their focus is help clients identify and mitigate risks that would impact property, product or lives. Common purpose is reinforced in several ways at FM Global: people hired are a fit with its goals and purpose; leaders are accessible, seek out opportunities to learn from employees, and believe knowledge is developed and embedded throughout the organization; employees have a common language and are developed to have a common understanding of the business and a quick, effective way to set directions; communication is transparent; employees learn from and support each other, examining what goes wrong to fix it; and there is a formula for everyone sharing in the company’s success. Kurtzman’s book shares many other stories of when companies have created common purpose, healthy and functional organizations, and financial success. Some examples: Pixar, Google, Apple, Wynn Resorts, Continental, IBM, Ritz-Carlton, and Clayton, Dublier & Rice. However, Kurtzman points out in our discussion that while HP was a common-purpose company under its founders (where people lived the HP way) and Toyota in his experience operated with true common purpose in the 1970s (with a sense of empowerment and respect for the individual) in neither case was it sustained. He estimates that 25 percent of companies have achieved creating a common-purpose organization. In general, he says, those that are likely candidates include: a young company (about 40 – 50 percent of start ups begin as common purpose); a company with a new, energized CEO; or an organization on its way back from losing its balance. Leaders of conscious capitalism companies and those involved in creating and sustaining common-purpose organizations share a leadership style that involves a sense of “we,” that recognizes and rewards employees beyond money and creates a value proposition throughout the organization that impacts stakeholders. What will it take for other business leaders – looking at the impact on their organizations of high turnover, poor morale, lost productivity, quality problems, and lost clients – to consider whether building a common-purpose leadership style might be worth the effort? Gael O’Brien is a Business Ethics Magazine columnist. Gael is a thought leader on building leadership, trust, and reputation and writes The Week in Ethics. Women Advancing to the C-Suite: Why So Difficult?